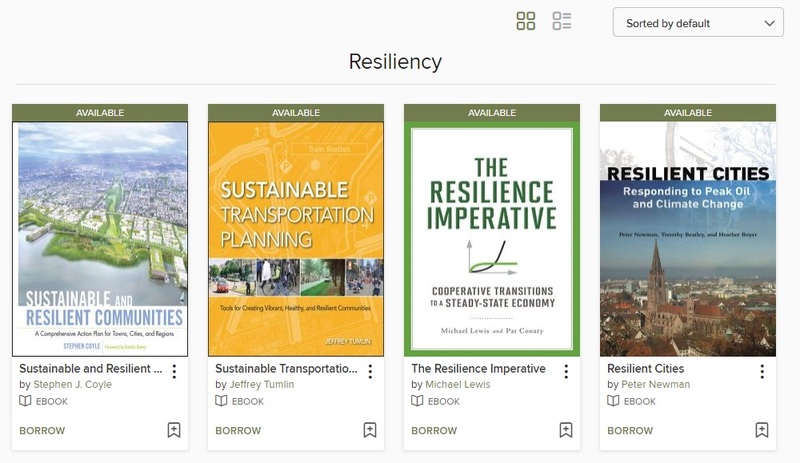 APA’s e-book library, included with your APA membership, released a curated collection of 18 titles focused on resiliency. APA's e-book collection on resiliency, available here. The intersection of land use planning and water resource management was the subject of APA’s first specialty conference, Water and Planning Connect, this September. Held in Kansas City, Missouri, the conference brought together experts and practitioners from both specialties as the first step in building a stronger foundation between the professions. Jennifer Henaghan, APA’s deputy director of research, recapped the events. 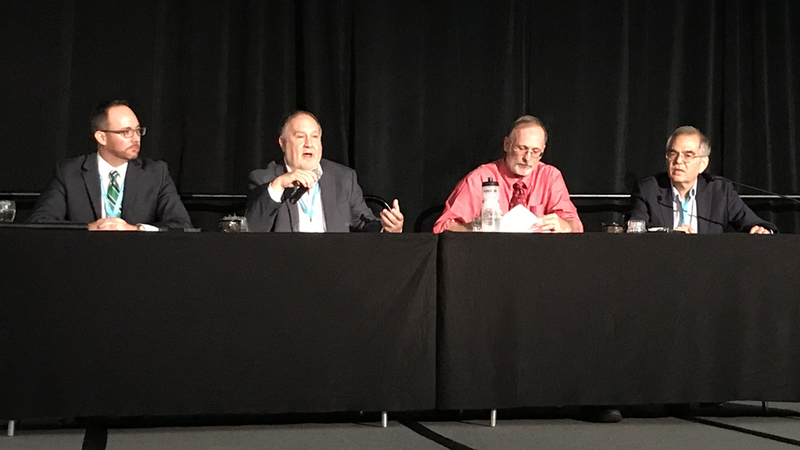 In the closing plenary, from left, Kip Peterson, William Cesanek, AICP, Jim Holway, FAICP, and David Rouse, FAICP, summarized the need for planners and water managers to work together on a comprehensive approach to advance the One Water concept. Photo by Jennifer Henagahan. APA also sent a delegation of members and staff to the annual One Water Summit. APA research associate Joe DeAngelis, AICP, drew these lessons for planners from the event. Additionally, APA’s Hazard Mitigation Center, in conjunction with the University of Nebraska-Lincoln’s National Drought Mitigation Center (NDMC), brought 30 planners, drought researchers, water management experts, and federal agency representatives together to discuss the role of planning in local and regional drought mitigation. Learn more about the discussions and results of the summit in this recap. Finally, Zoning Practice tackled the issue of coastal flooding, now top of mind due to Hurricane Florence in the Carolinas, in its June issue titled "Zoning for Coastal Flood Resilience." 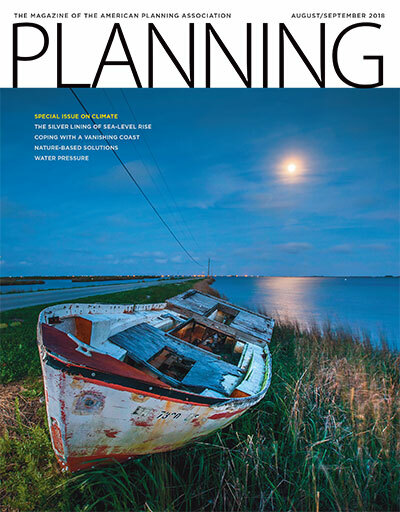 The August/September issue of Planning finds communities that are embracing opportunities for positive change as they prepare to meet the challenges of rising seas (in Virginia), coastal subsidence (in Louisiana), and extended drought (throughout the Southwest). July’s cover story, “Retail Realities,” looks at how communities across the country are rebuilding economic resiliency as brick and mortar retail goes to pieces. Coming in October, APA will be releasing a new podcast series titled Resilience Roundtable, featuring experts from the fields of hazard mitigation, disaster recovery, and environmental planning. Bookmark the APA podcast page and look for it coming up soon. APA’s Planner Profile blog series is a series of stories from APA members on how they got where they are — sharing their career path, experience, and thought leadership. Different resiliency planners have been highlighted over the years — here are their stories. Top image: A sunset scene in Norfolk, Virginia, shows rising sea levels in an estuary connected to the Chesapeake Bay. Photo by Flickr user Chesapeake Bay Program (CC 2.0).